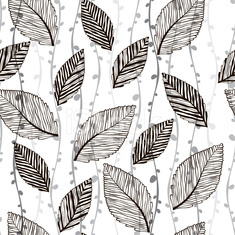 Monochrome seamless pattern of abstract leaves. Floral seamless pattern with birds. Cartoon vector background. Marine seamless pattern. Hand drawn vector illustration . Seamless pattern with marine rope and knots. Vector frame with spices and herbs. Set of citrus fruit - grapefruit, orange, lime and lemon. Seamles Autumn pattern with colorful leaves.